a) What vitamin C level does kiwifruit contain? There is no point eating lots of kiwifruit to get high vitamin C levels, if kiwifruit doesn't contain much vitamin C! Like any species there is massive variation in vitamin levels. 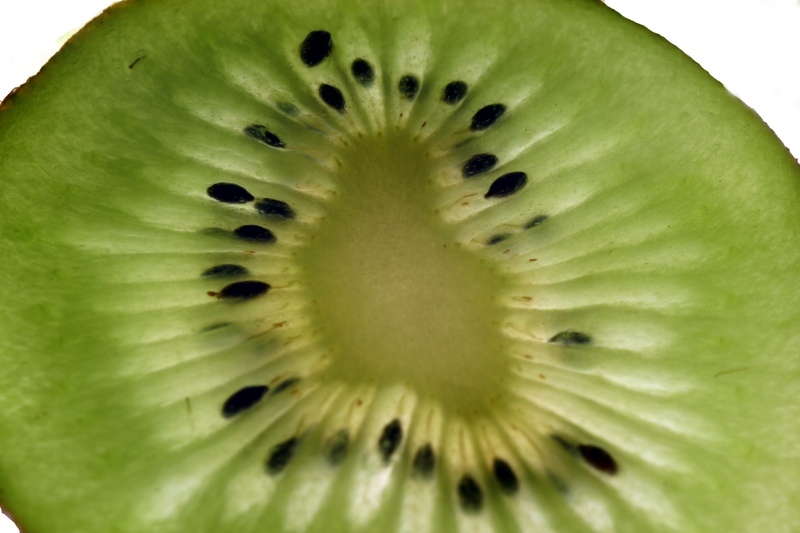 Kiwifruit can have as little as little as 2 mg per fruit or up to 340 mg a massive range! The majority of kiwifruit are either the yellow chinensis, or green Hayward cultivare. The yellow range from 31 - 340 mg, with the Zespri Gold having approximately 100 - 150 mg per fruit. The green have range from 66 - 120 mg. These levels place kiwifruit as one of the best (commonly available) sources of vitamin C.
b) Vitamin C levels with storage. It is one thing to have vitamin C when kiwifruit are picked, it is another thing when they have been months in cool storage. It is known that storage of kiwifruit in cool stores for 2 months reduces the vitamin C by approximately 20%. A further 4 months storage, 6 months in total, doesn't decrease the vitamin C much further. What is exceptionally interesting is that a week at room temperature (25 degrees) actually brought the vitamin C levels back to harvest levels in some fruit. The average vitamin C level came back to harvest level, but there was wide variation in the vitamin C level. It is also interesting to note that the vitamin C levels are lower in fruit that is shaded, come pared to the ones that are in sunlight. Also the ones shaded are smaller. This means when you purchase kiwifruit go for the bigger ones. So in conclusion. The varieties of kiwifruit that you purchase in the store aree a great source of vitamin C, choose the larger ones, over the smaller varieties. Once the fruit are out of storage, hold them at room temperature for a few days before eating, will increase the vitamin C level, eg put in a fruit bowl, not in the fridge.